Fragmentation of the French Left: Génération.s, ( Benoît Hamon, former Socialist presidential Candidate) holds its first Conference. Benoît Hamon stood as the candidate for the French Socialist Party (PS) and the ‘belle alliance populaire’ in the 2017 Presidential elections. He was selected by a Primary, in which 2 013 743 people voted in the final run off. Hamon’s victory momentarily gave a ray of hope for the party. 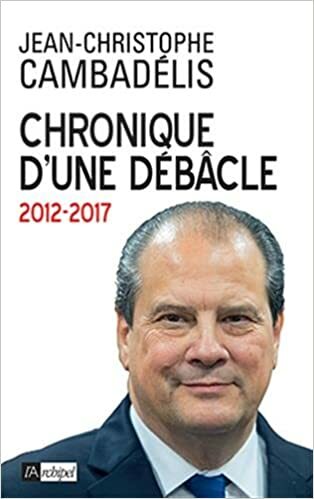 His Pour la Génération Qui Vient (2017) promised to free the land from the “liberal nightmare” and to launch a “democratic awakening”, Citizens’ Initiatives, and a human centred approach to the technological revolution. Apart from green policies, he advocated Universal Basic Income. In the contest Hamon received a humiliating 6,36 % of the vote. In the following contest for Parliament he lost his seat in Yvelines, eliminated in the first round with only 22,59 %. The Socialists suffered deep depression after many of their members and allies left to back Emmanuel Macron (his ‘treason’ still rankles with François Hollande). Those with some will to continue are torn into mutually recriminating factions, and have only 30 MPs. Hamon and his allies created their own party. Most of the Young Socialists ( MJS) joined as well as former MPs, and councillors from the left of the PS. Génération.s, le mouvement (English: Generation.s, the movement) is a French political party created on 1 July 2017 by Benoît Hamon who, according to its founder, aims to “Refound and gather the left” in France. Sometimes rendered Géneration(s) or Génération·s, it was formerly named Mouvement du 1er Juillet (1st July Movement), and has also been known by the short name M1717. Its foundation follows the sharp decline of the Socialist Party in the 2017 presidential election, where Benoît Hamon was a candidate, and the legislative elections, in which he lost his seat as a deputy. 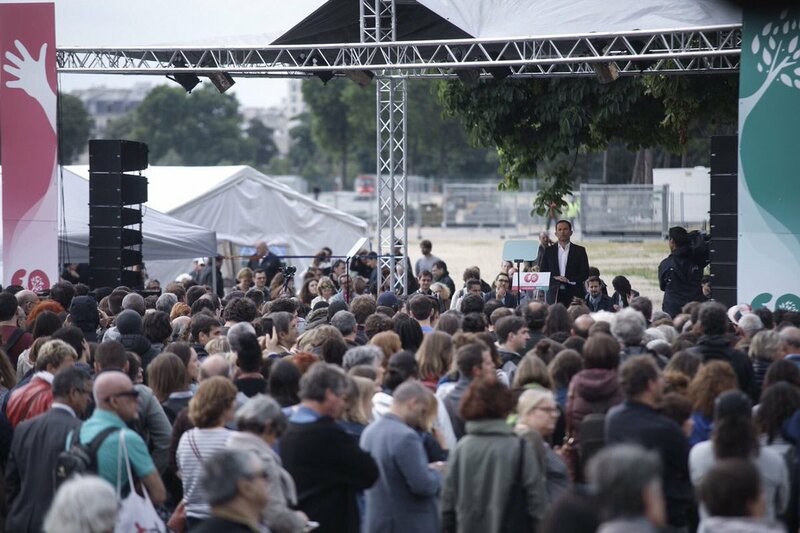 The movement presents itself as an initiative to assemble the forces of the left in France. The political ideologies it supports are European federalism, ecosocialism, and democratic socialism. The new party claims to have 60 000 members and a thousand or so local committees. But their profile in national politics is uncertain. The weekend Convention, attended by up to 1500 activists discussed alliances with Yanis Varoufakis, and the DIEM25 for the next European elections. Negotiations with what remains of the French Green party, the EELV., have not gone well. La France insoumise, engaged in its own battle for ‘hegemony’ on the left, under the leadership of Jean–Luc Mélenchon were sniffy. But the genial leader has now offered a “pact of non-aggression”. Which is very kind of him. 1/2 – Je fais une offre à @benoithamon et son parti : renoncez aux agressions inutiles et parlons tranquillement. Faisons un pacte de non-agression et respect mutuel. There is talk of an agreement with the PS… (Après un an d’existence, Génération.s cherche sa place à gauche). More information: Le Manifeste de Génération·s. 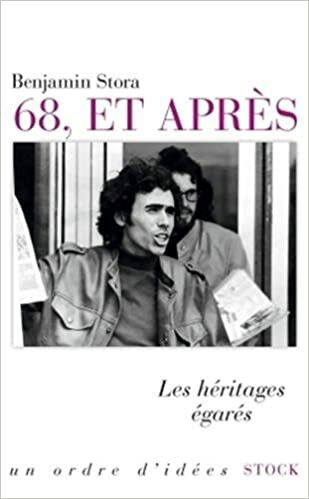 Didier Motchane, central figure of the 1970s French Socialist Left, passes. Didier Motchane – under the Symbol of the Rose he designed. Mitterrand was indeed elected in 1981 on a radical Socialist Programme, 110 propositions pour la France. Didier Motchane, has just passed away. He was one of the architects of the 1981 Projet Socialiste, which lay behind this list of proposals. 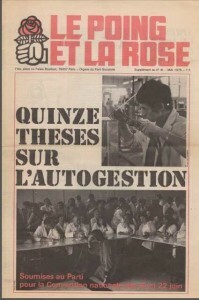 It outlined a detailed strategy for self-management, autogestion, within a wider perspective of nationalising companies, a line put forward in 1975 as “les quinze theses sur l’autogestion du parti socialiste“. So radical was this programme that it clearly set forward the Socialists’ structural economic and political reforms, including legal changes to defend human rights, and backing for workers’ power, within the perspective of a transition to socialism. Motchane was a key figure in the Centre d’études, de recherches et d’éducation socialiste, CERES, (1966 – 1986) a left wing current which (as the Wikipedia entry notes) had few parallels in other social democratic parties with the exception, perhaps, of the British labour Party. As a ‘think-tank’ its influence was its height during the 1970s, and, as noted above, on the formulation of many aspects of Mitterrand’s 1981 electoral platform. For some on the British left Motchane had been already noted in the 1970s for his debate with the Marxist political theorist Nicos Poulantzas and other left wing figures in the Mélusine discussion group, and his interest in Antonio Gramsci (Bob Jessop). He was also open to a wide variety of radical left ideas and broader philosophy from Maurice Merleau-Ponty, Emmanuel Levinas to the sociology of Pierre Bourdieu, Didier. Le grand Motchane et mes années CERES. His career began in the higher spheres of the French administration. 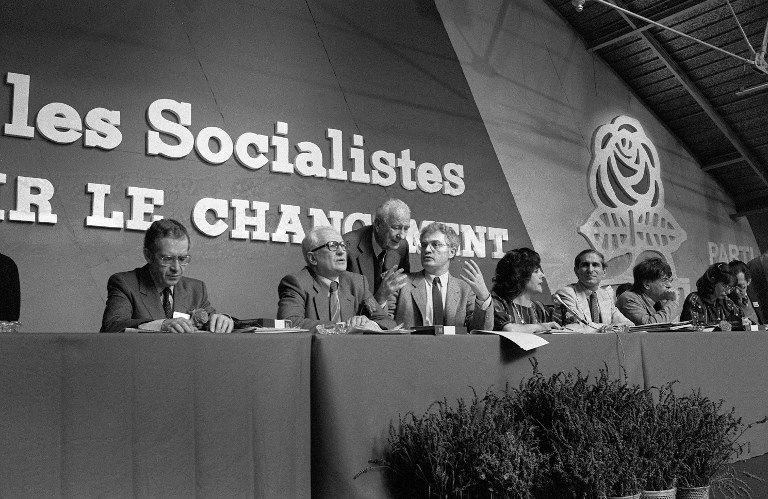 CERES became a key player in the Parti Socialiste in the mid-1970s. Their intention was to bring socialism into social-democracy. He began a long journey, from radical democratic socialism, opposed during the latter half of that decade and into the 1990s to the ” social-libéralisme” of the current around Michel Rocard, to an increasingly nationalist republicanism. Motchane’s evolution took place in close relation to his close comrade Jean-Pierre Chevènement. Chevènement was Minister of Research and Industry from 1981 to 1983, when he resigned, for the first of three times in his career. He disagreed with the change in economic policy made by President Mitterrand in order to stay in the European Monetary System. He has said that “a minister has to keep his mouth shut; if he wants to open it, he resigns” (Un ministre, ça ferme sa gueule ; si ça veut l’ouvrir, ça démissionne ). However, he returned to the cabinet as Minister of National Education from 1984 to 1986. Appointed Minister of Defence in 1988, he served until 1991, when he resigned due to his opposition to the Gulf War. After this he opposed the Maastricht Treaty, an issue on which Mitterrand and the PS led the “yes” campaign. In 1993 he left the PS and founded a new political party: the Citizens’ Movement (Mouvement des citoyens or MDC). These developments were mirrored in their publications. From the left wing socialist journal En Jeu, they began a systematic critique of the Parti Socialiste’s (PS) politics which moved them increasingly outside of the party’s orbit and, eventually beyond socialism itself. Motchane left the PS in 1993, at the same time as Jean-Pierre Chevenement to participate with him in the creation in 2003 of the Mouvement des citoyens (MDC) which became the Mouvement républicain et citoyen (MRC). Eurosceptic they became ‘sovereigntist’, putting national control of the economy, and the power of the French Nation, at the centre of their politics. This meant opposition to European integration, from the Maastricht treaty (1992) onwards. Chevènement himself was not completely left out in the cold. The MDC participated in the Gauche Plurielle (Plural left, Socialists, Communists, Greens, left radical party) which between 1997 and 2002, under Jacques Chirac’s Presidency nevertheless held the post of Prime Minister and ran the Cabinet. The MDV leader became member of this government, led by Socialist Lionel Jospin, and was soon known as a hard-line Interior Minister (1997 – 2000). He left his post after expressing opposition to decentralising measures for Corsica. Outside the PS his Euroscepticism and sovereigntist turn has developed into a position ‘beyond’ the left right division. During the 2002 Presidential election hevènement hoped for a candidate who would be neither of the Right or the Left (ni de droite, ni de gauche). In 2015 he spoke of the need for unity between ‘patriots’ of the right and left, (réunir tous les patriotes de droite comme de gauche). Strongly secular (a defender of laïcité) he was nominated in 2016 by President Hollande as…President of the Fondation pour l’islam de France. Motchane was perhaps more subdued in his turn to sovereigntist politics. During the 2012 presidential election, Didier Motchane lent his support to Left Front candidate Jean-Luc Mélenchon. But the Le Monde obituary notes that Motchane moved from socialism to a politics centred on the Nation – in French terms, The Republic. Mediapart has published these tributes. Unable to be at your side, allow me to greet in a few words more than an old friend: one of those men of commitment who have never sacrificed their convictions to their careers, and who are not numerous…….We will try, dear Didier, not to forget you. (1) Mais il m’a appris que, au début des années 1970, il avait souhaité que la Ligue communiste – le groupe d’extrême gauche pour lequel il avait le plus de considération intellectuelle – rejoigne le CERES. PHILIPPE CORCUFF. Hamon: I’m Leaving the Socialist Party, not Socialism. Hamon, with a background of many years of work in the PS, as a party spokesperson (2008 – 2012) including serving as a Minister (2012 – 2014) he played a leading role amongst its left-wing tendencies, including amongst the ‘frondeurs‘ who criticised the drift, fiscal orthodoxy, and market friendly politicies of President François Hollande and his governments, considers that he and his new association will be part of the foundations with which the French left will be able to build a new “common Home”, ( ‘la maison commune de la gauche’). For the recent Presidential contest Hamon was selected as the candidate of the Parti Socialiste through the publicly open “primary” of the Belle Alliance populaire (BAP) launched by the PS and its close allies. In the second round he won with 58,69% of the votes (1,181,872 ballots). His rival, former Prime Minister Manuel Valls, lost with 31,48% (831,871). 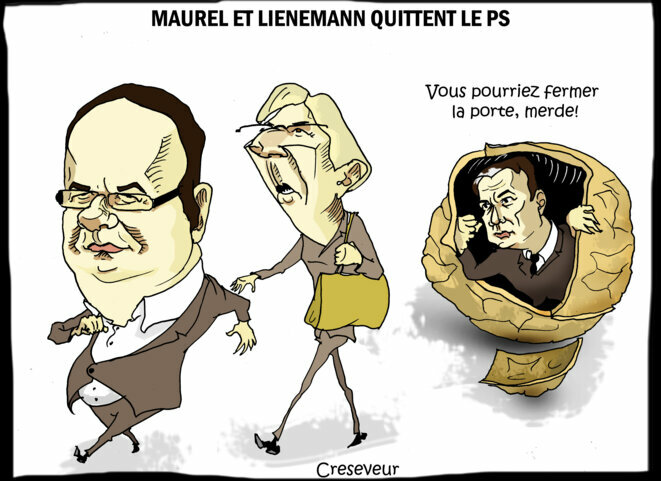 Despite signing an agreement to respect the result Valls (and it is alleged many others close to President Hollande) lost no opportunity to sabotage Hamon’s campaign. Amongst those who blamed the left-wing ‘frondeurs’ for the collapse of the French left vote, Valls was at the forefront of those who backed Emmanuel Macron. The right-winger left the PS a few days ago to more clearly show his support for the ‘centrist’ new President. Valls now sits as an MP as part of Macron’s La République en marche (Manuel Valls quitte le Parti socialiste et rejoint le groupe LRM à l’Assemblée). Hamon accuses Macron of representing a social minority. His counter objective to bring together that social majority with the left to become a political majority. Amongst those present at the new movement’s first public meeting were former Ministers Philippe Martin and Dominique Bertinotti, Green politicians, Jannick Jadot and former Green party (ELEV) leader, Cécile Duflot as well as representatives of the Communist Party (PCF) Fabien Guillaud-Bataille and (a former leading member of the Trotskyist Ligue communiste révolutionnaire, at present a member of the PCF) Christian Picquet. More Le Monde: Benoît Hamon annonce qu’il quitte le Parti socialiste. This report summarises the contributions of the meeting. All were agreed, despite their differences on the need for “new structures for the left” “reinventing” the and building anew the left. (tous, malgré leurs divergences, s’accordaient à dire que la gauche devait se « reconstruire », « se réinventer » et abandonner ses vieilles structures.) on the ruins of the PS which seems now to be like a Church without believers. 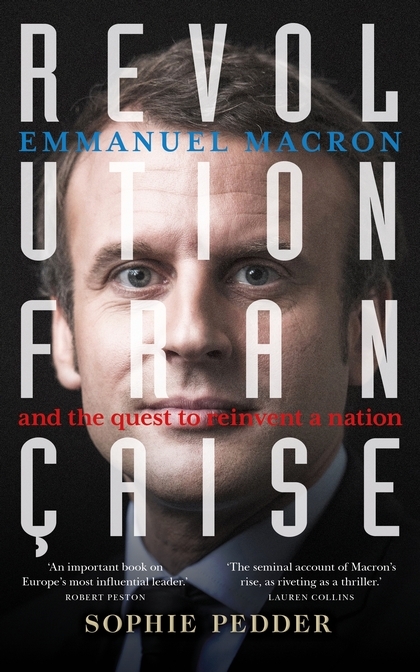 In his pre-Presidential book, Pour La Génération qui Vient (For the Coming Generation 2017), Hamon begins by describing his own generation (he is still in his forties), born after the post-War boom, a cohort that has known four decades of crisis. Yet today, he continues, politicians look backwards to an “imaginary” country, a land now ‘besieged” and in “decline”. The supporters of fear and nostalgia have to be faced up to, there is no “homme providential” (Man of Destiny) that can save us, no saviour, “Au culte assumé du chef, la gauche a toujours oppose la force d’un espoir collectif” (against the claims of the cult of the Leader, the left has always put forward the power of collective hope, Page 18). We hope that Hamon can fulfill his objectives. 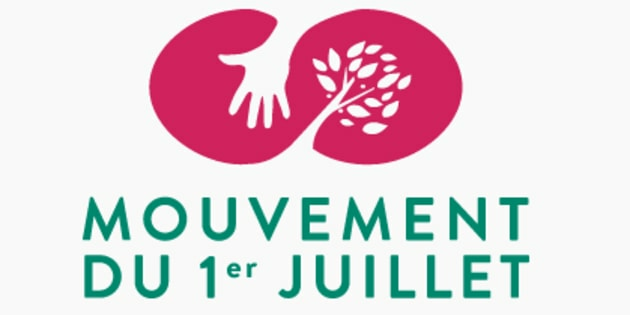 The new association, the Mouvement du 1er-Juillet, will be based on participative democracy and local committees.